These quartz movements are specifically designed to give you an accurate reading of the rise and fall of the day’s tides. 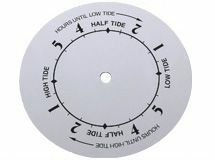 Based on lunar day of 24 hours and 50 minutes, these American Made tide movements use a standard hour hand to display the daily tide activity. Price includes choice of an hour hand as an indicator hand, which can easily be trimmed to a shorter length, and brass mounting hardware. If you would like a different style of indicator hand, you may purchase any pair of I-shaft hands and use the hour hand (short hand) as the indicator. Hour hands are normally 2/3 the length of the corresponding minute hand. The maximum length of a tide indicator hand that can be used is 6".